When this doe was born i was so lucky she was alive, born 2.5 weeks early and breech with knees up backwards, so lucky to have my little girl with me. this little doe is super stunning with width galore and the attitude to go with it. 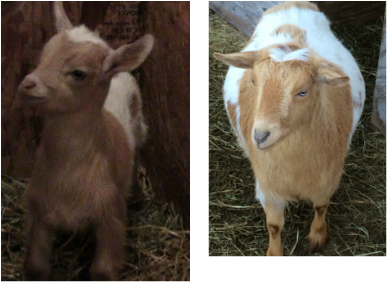 She was so tiny at birth and so frail, but she has been on a bottle due to mom not coming into milk and getting mastitis. She means so much and this cross last year produced two amazing buck kids and both were retained and champions this year. She looks like the one full brother but taking after the other one, which is tremendous, just loved the way she is turning out at such a young age!! This little doe is stunning and wow she can show very well, never being worked with and never set up til NGE she showed she has what it takes to be a lifer here at Parrish Farms. Wow!!! i just love this does little FF udder!! she only had a single but this does udder is really nice and I have decided to keep her single buckling to see how he turns out :) just love my Apprentice daughters and really liking the looks of his grand kids too!! MVF 2014 pic to get final leg toward ADGA Permanent Championship. Spectacular bloodlines on both parent's sides! Fern is a smaller sized nigerian & definately won't go over height. This doe is so small. I REALLY love these lines and all the goats in her pedigree. I am just so happy with how this girl turned out!! She is now Permanent champion in both ADGA and AGS and i couldn't be happier with her udder and production as a 2 year old FF with a singleton in 2014, with over 800# of milk earning her star as well as great BF and Protein earning her stars and ARs in both associations!! 2014- 1xGCH at the MVF. final leg towards ADGA permanent status!! We got this doe early spring and she was so tiny at her age we could not breed her til this fall. She has finally come into her own and into her self and is turning into a stunning doe. This doe freshened in with the most amazing udder! her rear udder height and width to her rear udder not to mention the smooth blending of her fore udder too. this doe is stunning and can't wait to see how she matures more. 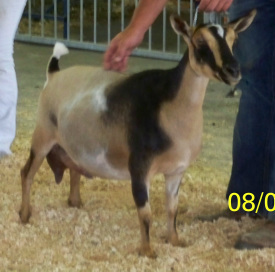 Finished as a 2 yr old FF with a single buckling :) I am so happy to own her!! Dam rated V in General Appearance, V in Dairy Character, V in Body, ---in Mammary and got a V for Final Score in a linear appraisal back in August of 2008. 2010 ADGA Linear Appraisal (nursing, not being milked)= final score of 89!!!! Very Good General Appearance, Excellent Dairy Character, Excellent Body, Excellent Mammary. 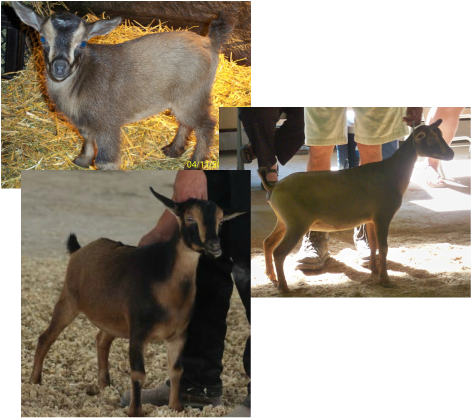 Sire's lineage includes: NC Promisedland RC Obama*S*B & MI Sugarcreek Yo Blue Yoko GCH AGS Caesar's Villa LV Breezy 1*M #8 Nigerian Breed Leader for Milk in 2009; Great-granddam: Roshasharn's WitchHazel 2005 AGS National Best Udder! 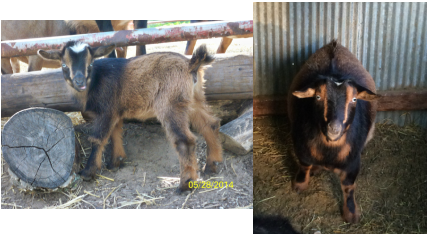 Top Picture just a few weeks old, Bottom Pic 2013 NGE 4 Jr GCH and 6 1st . 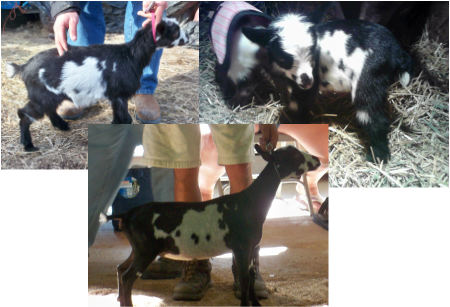 Middle pic to right at MVF 2013 1st place. 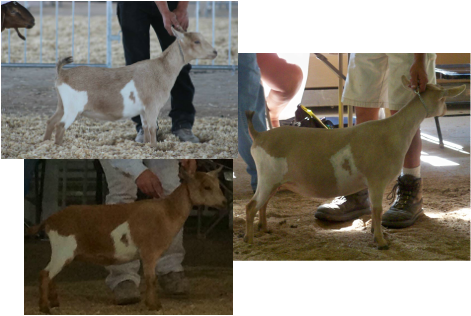 2013--9x1st, Took 4 of 6 jr grands at 2013 NGE, her jr leg in ADGA & AGS was given by Josh Kaplweski 9/27/2013, but she won multiple wins after that day at the NGE only losing to Parrish Farms AA Galatea Roza and Parrish Farms API Dream Girl. 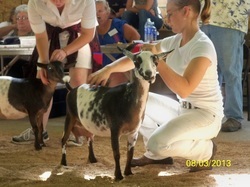 This doe is really blooming into a tremendous doe, ANOTHER GREAT ARTHUR DAUGHTER with a tremendous udder for an FF doe!! 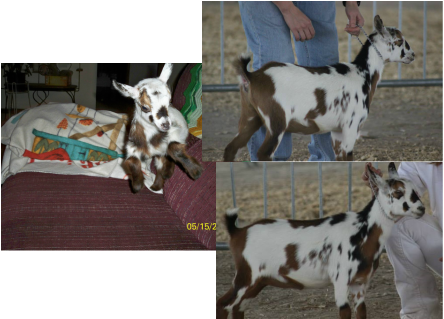 MY 1st Star Doe, done on our farm as a FF 2 yr old!! 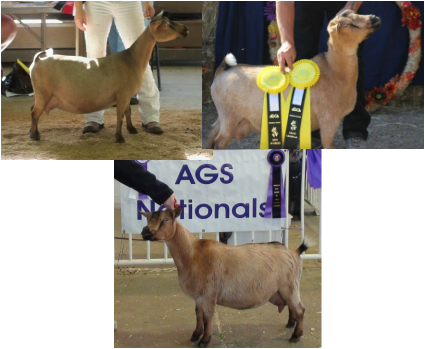 Many Grand Champion and Res Champion wins at the 2013 NGE. Pipper is the sweetest most docile doe i have in my herd with so much body capacity and width to her as well as spring and openness. She has great feet and legs with just everything thing i want in a doe. 2014 1xGCH at Colfax Iowa- giving her her final leg in ADGA for permanent Status :) pending all paperwork. BOB also. 2013 - 2xGCH in ADGA at the NGE, 2 BOB. Thank you so so much Lauri for letting me purchase this beautiful doe from you. She is tremendous and I just love this doe!! Mocha and I have really bonded since I got her in July and this is one doe that I am just super excited about. Well i was super excited about this doe, she is gorgeous, deep, long, wide and a powerhouse, which i love alot. 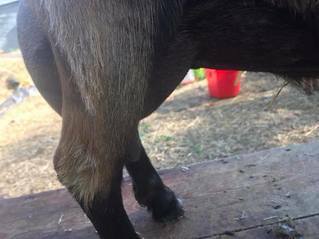 She is just mean to the other goats and hurt one of my does really bad. 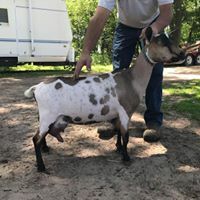 She is super pushy and not the best to catch to milk either, she runs and has to be chased to be caught to milk her then she drags you to and from the garage to be milked and returned to the pen, but really good on the stand and one of the best to milk and easiest to milk. The biggest thing i dislike about this doe is her attitude and how she is real mean to the other does and runs from me prior to milking, this is something she has done since her first owner and I found this out the bad way with her hurting another doe. 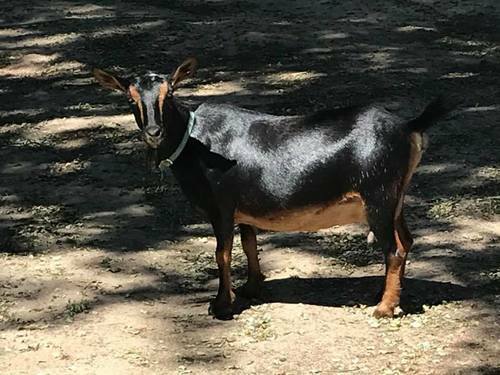 Mocha is now an SGCH doe through ADGA Udder floor is well above the hocks, teat placement and rear and for udder are amazing!! 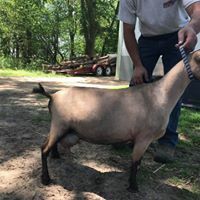 This doe just milks like a dream and even though she is mean to other does, she will be worked with and kept here and kept her entire life here at Parrish Farms. Cookie is so much like her sister and takes after their mother so much. 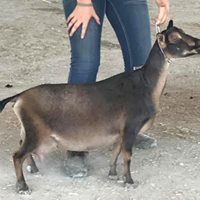 Beautiful, dairy, long, level, body capacity, and the wedge shape when viewed from the side that has been mentioned at all the shows this year. 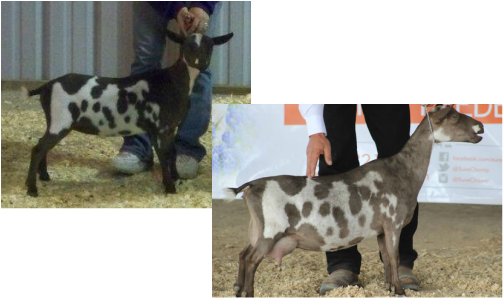 She goes back and forth with her sister in the show ring and i tell ya its hard to decide which one is better than the other. Her sweetness and her look just says wow. I love her to pieces and she is one that will never leave Parrish Farms. Beyond was a doe that when i got her I wasn't sure what was going to happen, but this doe has really turned out nice and was a sleeper until after kidding. 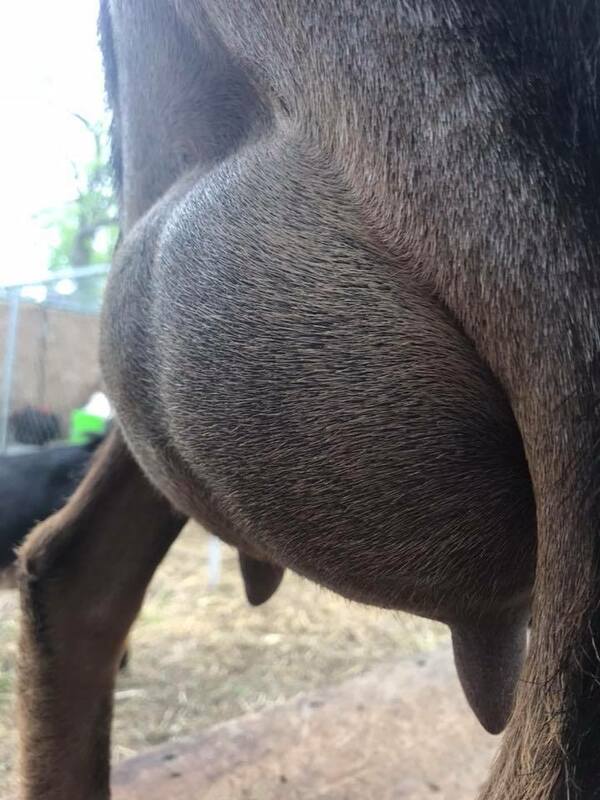 She is a self sucker and nurses herself, but even with this her udder is still very nicely blended in both fore and rear udder with a high attachment and very nice capacity. this doe is also very smoothly blended from withers through the hooks and pins with nice width, openness and spring of rib.She gave me 2 beautiful buck kids in 2012 and a very gorgeous doe kid in 2013 all of which were retained. This doe has become such a gorgeous doe and is really filling out and one of my best does I own. 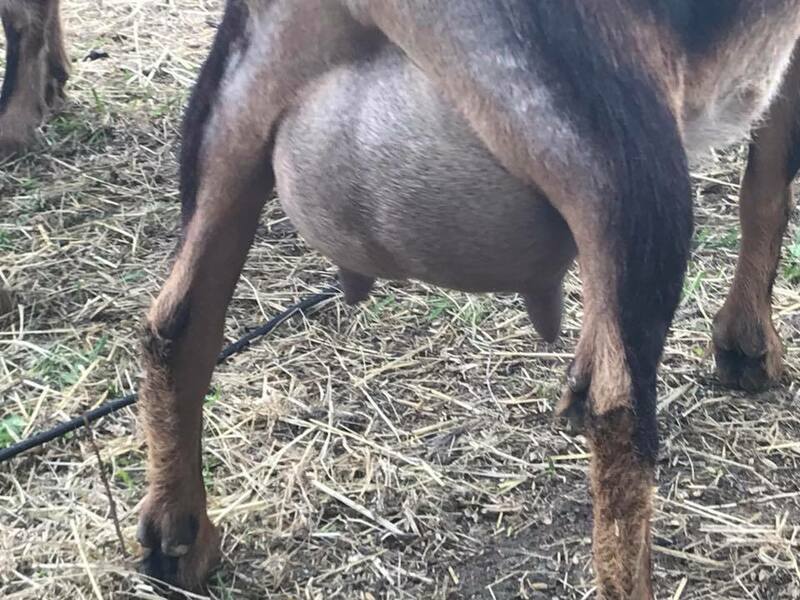 When she freshened her first lactation she had bigger teats and her teat placement was on i would have liked to change, but now with this 3rd freshening all i can say is WOW, her teats are just right now and her teat placement is really nice, couldn't ask for a better udder on this Pippin daughter!! Beyond Freshened with her 3rd freshening 1/7/2014, she had triplets and WOW is all i can say about that beautiful udder. She is raising her kids and all 3 are retained. She had 2 does and 1 buck. 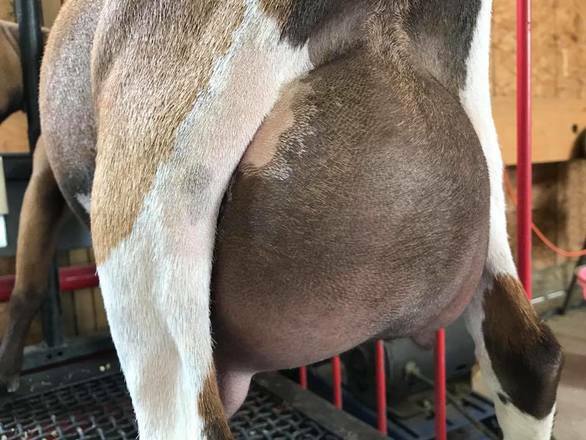 Her udder is so high and wide in the rear udder, they say it can improve with freshenings and well with this Pippin Daughter it has really gotten very nice with this 3rd freshening. After kidding 2.5 weeks early in 2013 and having to be dried off due to no milk and mastitis this freshening is going to be amazing and probably by far her best yet!! 1RGCH Juli Huffman NGE 2013 in AGS. This little doe is super dairy, long, level, and width to boot. She is really turing out nice. She looks so much like her daddy but has her momma's width! Not to mention for being a dam raised doe she is very sweet and loving! 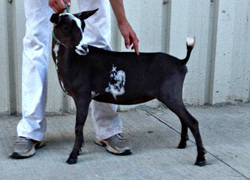 This little doe is very smoothly blended with a lot of dairy character and stands on a good set of feet and legs. I really like the looks of this doe. 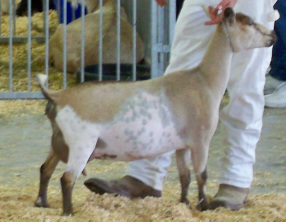 as she is getting older, she will be open and go through her jr show career this summer.This doe has been decent in the show ring this year finishing in the top in almost all shows. 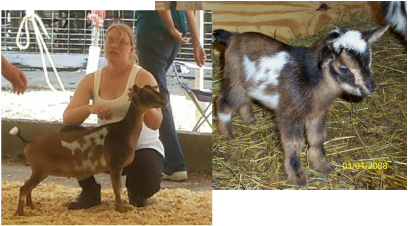 She is a wild child to catch in the pen, but really settles down at the shows and in the show ring and shows really well for Justin. 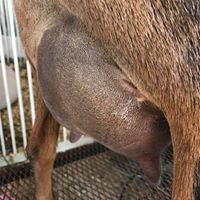 This Does udder is very correct, she has a nice rear udder attachment, great teat placement a very nice medial, her lateral attachments are very nice too and her fore udder is nothing to complain about either, this doe was one i wasnt' sure about when she was growing up, but now she is amazing look forward to having her here for many years to come. Her kids are super stunning and both from this FF lactation wil be retained. Happy Happy Happy to have a Stag daughter here to Parrish Farms. Thank you so much Colleen!! I really was not sure about this doe when she arrived, super tiny, weaned really early from mom or bottle and was sick with scours and not wanting to eat when she got here on transport. 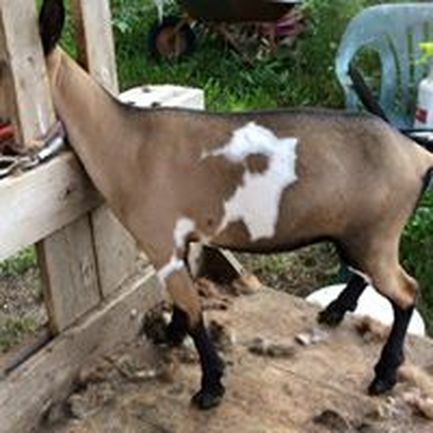 She has blossomed into a gorgeous little doe and I really need to get some new pics of her, this was when she was starting to shed and when she was copper def, now she is sleek and beautiful and wow the depth of body she has is great as well as the width she has between the hocks and chest floor. What i would like to change is i would love to lengthen her out more. I think she is going to be a sleeper and will just flourish as a FF and beyond. 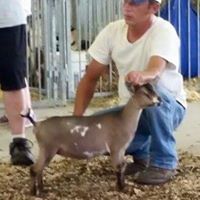 This little doe actually did very well in shows at the NGE making all champion drives didn't like her attitude about showing but we will work with that this winter. 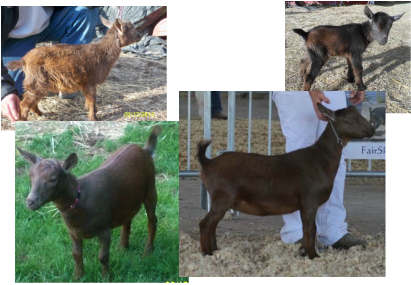 1xJrGCH (adga),2xJrGCH(ndga) 3xJr RCH (2 ndga,1 adga), 10x1st, 3x2nd, 3x4th, 1x6th, 2xSR Grand Champion doe, 2xRes SR Grand Champion doe, 1x Res Grand Champion Sr Doe in Nigerian Specialty with Jay Rudolph, 2xBOB. Final Leg for ADGA CH given by Jay Rudolph at MVF. I absolutely love this doe, she is by far my favorite doe on the farm. Thank you Amy and Audrey for letting me get this doe! She is a doe that is super flashy, with alot of body capacity, width galore, long and level topline through her rump from her withers. She is a doe that just carries her self with extreme pleasure and proudness. Ditty as we all call her is one of those does that just makes you smile every time you are around her. 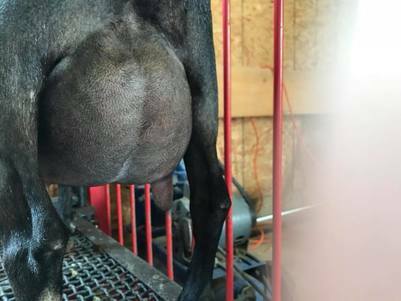 She just in April with her second freshening and has a very capacious udder, with a smooth blending foreudder, nice teat placement, length, and teat structure. I however do want to change the medial and make it stronger and heighten that rear udder some. This doe is now finished in ADGA as a 2 yr old 2nd freshener. on her first DHI test this year at 11 days fresh she milked 4.1#, then on 29 days fresh she milked 5#, she had triplets this freshening and wow did that udder bloom, still wishing the medial was a little stronger and that the rear udder height was higher, but this doe is gorgeous and very milky :) I love this doe to pieces. 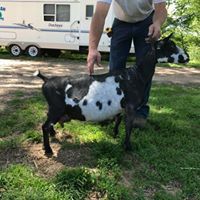 This doe has the most milk and most capacious udder in my herd, but i will be honest and say she doesn't have the highest rear udder or best medial in my herd, fore udder quite possibly the best. I just love this doe though as her confirmation is probably the best i have in my herd, her dairy character is amazing and she puts everything into her udder for milk for me and the kids, this doe is also a dream to milk with that buttery soft texture to her udder and such an easy to milk teat structure and size. When she milks out she milks out to nothing. Its amazing how well and how much she milks. Ditty should be getting her milk star in ADGA and AGS in all categories of Milk, BF, and Protein this lactation as a 2nd Freshening 2 yr old :) She is just stunning and amazing, Finishing in ADGA as a 2nd Freshening 2 yr old just makes me so happy!! I love her to pieces and this doe is just everything to me! My first registered Nigerian doe that i owned is this doe and I tell you what she has produced great kids and is so amazing herself!! This doe is my life and is the sound part of my herd, could not continue without her! !